Jeffrey Welch's Blog: How Long Do Dogs Live? I’ve often noted that dog ownership is a life commitment, and never one to be entered into lightly. What kind of commitment are we talking about? How long do dogs live? A cursory internet search tells us 10-13 years. There are averages, which we’ll explore below, but there are also a variety of factors that affect a dog life span. The most significant factors are size and weight, though there are a host of others, including gender, breed, and quality of life. Regardless of the variables, the average life span of a dog is accelerated in every respect compared to the average human life. Dog pregnancy lasts about two months. The time between whelping and sexual maturity of the average dog is between six months and two years. Even the clichéd concept of “dog years” is underscored by our knowledge that dogs age faster than humans. The average dog life span can be estimated by the outliers. The shortest-lived dog breeds are the Bulldog and Irish Wolfhound, which live between 6-7 years, followed by the Bernese Mountain Dog, Great Dane, and Mastiff, which average 7-8 years. Lists of the longest-lived dogs on record give ages between 20-29 years. The vast majority of dogs will naturally fall somewhere between the two extremes, from 8-19 years, for a very simplistic average of 13.5 years. General factors such as breed and gender play a part in dog life span. Mixed-breed dogs — by which I mean mutts, not the portmanteau-heavy list of designer dogs — not subjected to the narrow constraints of breed standards and pedigrees, come closest to the 13.5 year average dog life span. Female dogs also tend to live longer than male dogs. This leads most articles on the subject invariably to conclude that the dogs with the longest life spans are small, mixed-breed female dogs. Based on all the research I’ve done, every source agrees that size and weight are the single most important factors when we ask, “How long do dogs live?” Among small dog breeds (excluding toy and teacup variants) the average dog life span tends to be around 10 years. The very largest dog breeds, as well as those who are prone to obesity, tend to live between 6 and 9 years on average. Weight is even more significant when considering the average dog life span. Dogs who weigh between 20-30 pounds are the longest lived on average, and the scale declines as weight increases. Dogs from 30-50 pounds have shorter life spans, those from 50-90 pounds shorter still, and the shortest-lived dogs are those whose weight exceeds 90 pounds. The difference between the smallest dogs by weight and the largest can be 10 human years. There are no guarantees when it comes to the life span of a dog, but quality of life is under your control as a dog owner. Under this umbrella, we include diet, exercise, and stress. Portion control, regardless of brand or type of food, can prevent bloat and obesity in dogs. A steady and consistent weight over the course of a dog’s life can also mitigate cumulative respiratory and heart issues, such as congestive heart failure in dogs. Keeping your dog engaged over the course of its life is also something you can control as a dog owner. This includes regular exercise — walking, running, and interactive play — and toys that they can play with when you are not around. These things keep a dog’s mind and body occupied. 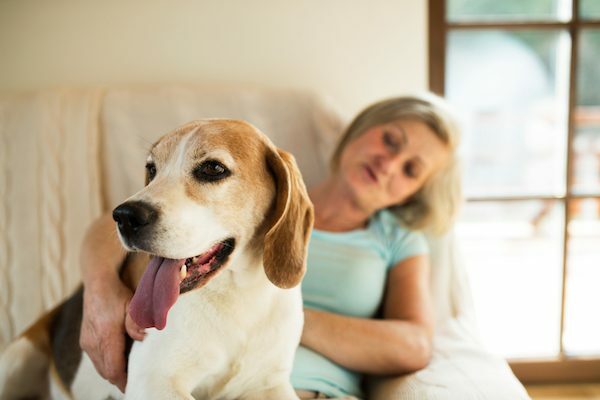 Limiting a dog’s stress and providing it with a comfortable, consistent, and nurturing home life also contribute to a dog’s longevity. Anyone who has loved and lost a dog will tell you that it’s never long enough. I’ve met dog people who measure out their own lives by the lives of the dogs they’ve loved. In a particularly poignant moment, a friend that my dog and I encounter on our regular walks once lamented that she might only own one or two more dogs in her own lifetime. My two favorite dogs lived for an average of 12 years, but you’ll never hear me say that Violet’s 15 years were any more important to me than the 9 years I had with Tina. Whether you adopt a puppy or a senior dog, the routines you establish together and the moments you share radically outweigh the numbers, no matter how statistically significant. The post How Long Do Dogs Live? appeared first on Dogster.